Motorola One Power is newly launched Moto phone and first Android Phone launched by Lenovo Owned Motorola. With the stock Android interface, the phone performance is bugless and fast. But After rooting, you can extend the functionality of the Motorola one power and explore more features. This article explains guide on install TWRP recovery and root Motorola one power without any issue. The company has surprised all by giving best specifications in the right price tag. Motorola one power is powered by Snapdragon 660 processor with 4GB of RAM. This smartphone sports huge 5ooo mAh battery and IPS notch display with a 19:9 aspect ratio. The phone has a 12 mp + 8mp dual rear camera and 20mp front camera for camera lovers. Download and install adb drivers on your PC before processing further. Enable developer options on your Moto One Power device – go to settings – about phone – tap on build number 7 times – go back – select developer options – enable USB debugging. In the Developer options, Unlock Bootloader option should be enabled. Step1: First of all, connect your device to Computer using the USB cable. Step3: Now you will get adb notification popup on the phone’s screen. Allow the access. Step5: Your phone now boots into Bootloader mode. Your phone now boots into TWRP recovery and install TWRP recovery on Motorola One power process is completed. 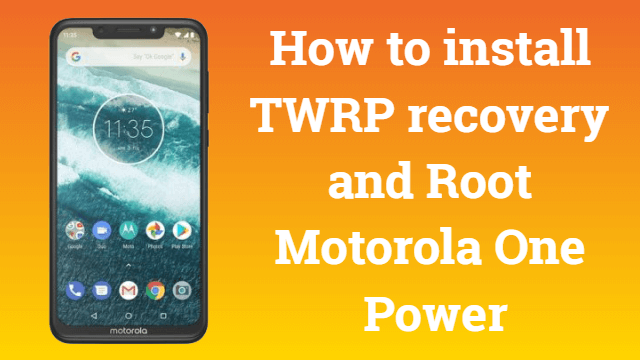 Once the TWRP recovery is installed on your phone, you can easily root Motorola One Power in a few steps. Step1: Download and save the Magisk Zip file onto your PC first, and then copy the zip file to phones Internal Storage. Step3: Now, select Install option and select a Magisk.zip file from the phone’s memory. Step4: Now, press on Allow modifications options and then select Don’t flash custom recovery option. Step5: Now, flashing Magisk file will begin and your Motorola one power is rooted now. By these simple steps, you can root Motorola one power easily. this guide explains How to root Motorola one power and also explained install TWRP on Motorola one power in detail. You can easily root and install custom recovery using this guide. Hope this guide helped you. If you have any query, problem, you can ask them in the comment section below.